Your car is your second home where you spend hours, day after day. You eat, drink and throw away trash. We carry things and return them. Thus Bagoto has created two fashionable key products. The car accessories which make driving more comfortable. Bagoto Vegan is a practical solution to put your daily items at hand reach when driving: keys, glasses, mobile phones, credit cards, remote controls. This accessory is placed on the gear shift either on the driver or passenger side. 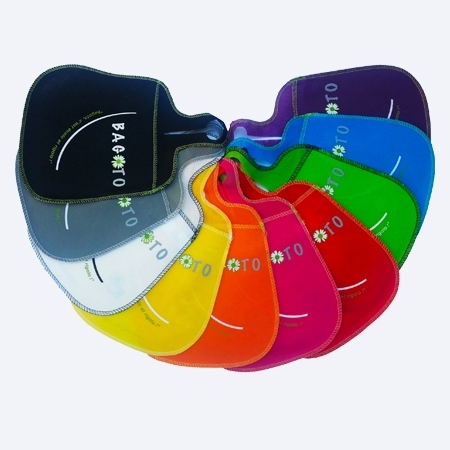 With Bagoto, you don't risk finding an abundance of small objects piled up on your dashboard or under your seat. When youre not driving, the Bagoto Vegan pouch becomes an elegant bag which accompanies you wherever you need it. Bagoto Vegan exists in Vegan leather, Havana or Black with a personalization option . A designer trash bag for cars in non woven material, washable and reusable to keep your car clean while preserving the environment. Bagoto Ecolo is an innovative concept destined to end the garbage being thrown out of car windows. 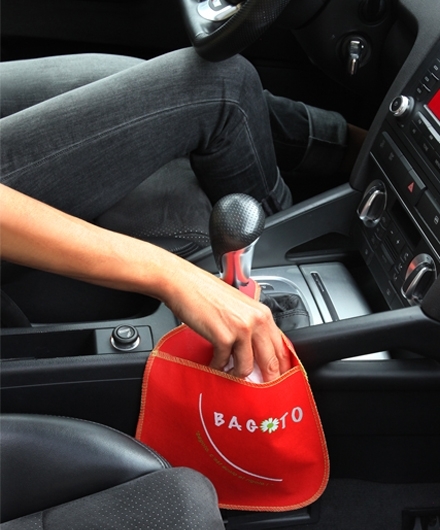 Nicer than a normal garbage bag, Bagoto Ecolo is a long lasting and decorative accessory which attaches to the gear shift and remains at hand reach. This compact and cute car trash bag quickly becomes indispensable. Eco responsible and functional: Bagoto was born from an idea to help the eco-friendly motorist not to pollute the roads thanks to an easy to use car trash bag. Humane and supportive: labeled CSR (corporate social responsability), Bagoto participates in the social and professional integration of handicapped workers. Bagoto Ecolo is a zero waste concept in the car. It is attached to the head rests to give children the good instincts from their younger age. Choose with your kids your style of bag between 13 colors to dress your car according to your mood. Customizable, Bagoto Ecolo is the ideal media for advertisers wanting to communicate ecologically. 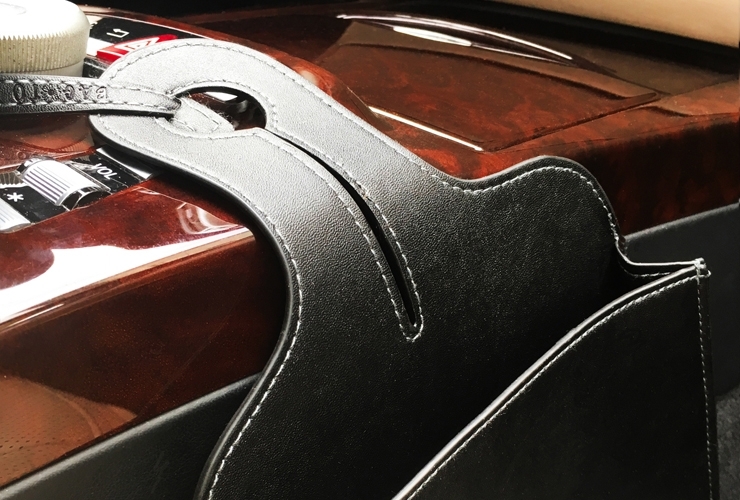 Bagoto has created the first vegan hand bag for motorists, the car accessory that won't leave you, even outside your car. Women had their hand bags and men their pouches with Bagoto Vegan motorists have their own. 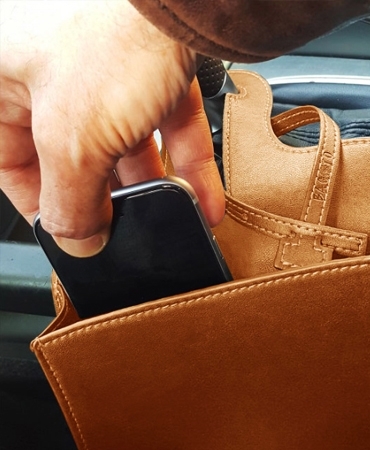 Simple and smart, the Bagoto Vegan pouch for cars becomes an elegant bag and is carried as such when exiting your car: you can keep all your objects, accessories and IDs near you wherever you go. 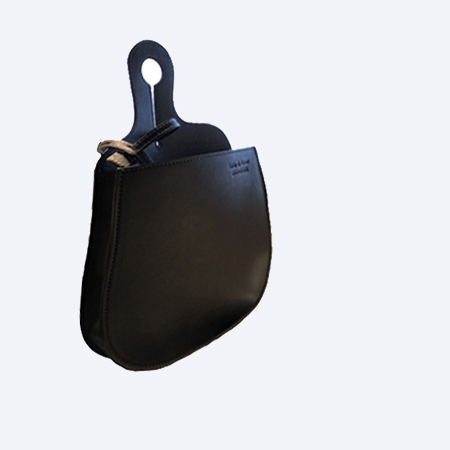 A high quality vegan bag inspired by luxurious leather goods and the interior of sports cars. Acclaimed by the press, the Bagoto Vegan bag is contemporary and keeps on surprising us with it's multiple uses: in the car, plane, horse riding or on a golf bag. Our clients are always reinventing new uses according to their needs and activities. 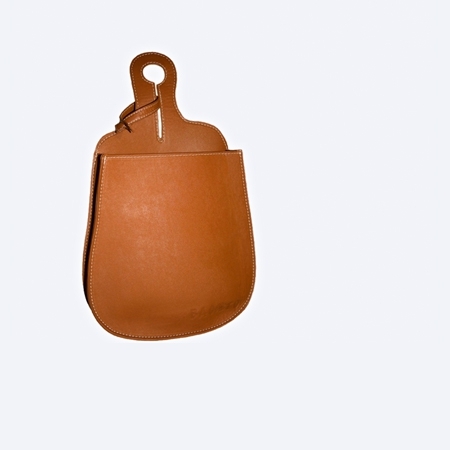 Bagoto Vegan is an original car accessory and an elegant aesthetic pouch wherever you go. It's conceived with the respect of the environment and animal welfare in mind, made of an ecological synthetic material: vegan leather. The process of fabrication of the vegan hand bag doesn't pollute and doesn't imply leather tanning nor animal skins. The vegan hand bag is an ethical and ecological alternative to the leather one for people who care for these values. Elegance, practicality and ethics united in the same accessory: the Bagoto car storage. The Vegan Bagoto car storage combines haute couture and distinctive shapes to adapt to the ergonomy of each car. Created in two distinctive colors of havana and black, the Bagoto vegan bag is a fashion accessory with high quality finishing design and as elegant as a hand bag or a man's pouch. Adaptable, Bagoto slides onto the car's gear shift or attaches to the head rest. This car storage has an adjustable gusset to receive your accessories and small objects: garage keys, sun glasses, pens, tissues. All is found in the same place, keeping the interior of your car clean and neat. Attached on the driver's side it allows you to take or put away an object without taking your eyes off the road. The Bagoto car storage is 100% cruelty free by using imitation leather, the elegance of leather with respect to animal welfare. Vegan leather is a product which respects the principles of the vegan movement and allows the creation of luxurious and refined accessories. The vegan bag has become the must have fashion accessory for people caring about animal protection and the environment. Founder of the Bagoto SAS company with her partner Ramzi Khoury, since 2011, Talia Mouracadé is totally dedicated to the development of simple solutions to problems pertaining to the issues of cleanliness and car tidiness in an ecological and affordable way. “I'm French with Lebanese origins having lived in Brazil, my country of adoption, where a large part of my family still lives. My life is culturally mixed, equally oriental and occidental with a Latin-American heart. Thus I belong to no particular culture or community and yet to all simultaneously. From this cultural blending was born a product, Bagoto, an idea I got from Brazil. I added a touch of European creativity, and thanks to that I have been working for values which are dear to me: ecology and social responsibility.